Jesus4UsAll UK Team - Welcome! We are only a small team here as we start this mission, but we are open for more to join us. Penny and Dennis are helping run the UK Operations, making sure you get the best from us and hoping you too can contribute to the success of our mission, making the knowledge of the Love of God known in today's world. "Hi I'm Penny, and I am very pleased to be on the Jesus4usall team. I live in Wales, UK, with my husband Dennis and my thirteen year old son. Dennis works in IT and is able to provide us with some technical expertise. Both my children have been brought up in the Catholic faith. My daughter Jenny is now at University in Wales and is also helping us develop the Jesus4UsAll Community, which is due to be launched in the next couple of months. In May 2005 my faith was suddenly awakened and strengthened when I was baptised in the Holy Spirit at a Healing Service in fact one that was organised by Spiro the founder of this site who was later to become a good friend. I hope that this site will help you to get to know the Lord better so that he can transform your life if he has not done so already. 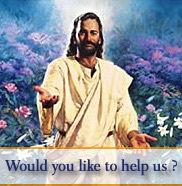 I am happy to be at your service and the service of our Lord Jesus Christ. God Bless You. I pray that this web-site and all we do here brings you closer to the knowledge of God's Love for you." Or Just Make a small Donation and that will help Greatly!